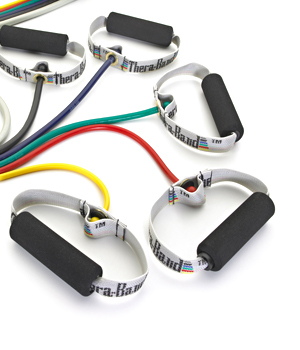 Our Thera Band Tubing resistance bands are the perfect portable resistance equipment. Personal trainers, you can stash these resistance tubes easily in your trainer's bag and have the right resistance for every client, no matter where your training session is. The colored resistance levels make it easy to identify the resistance level. Thera Band Tubing is an alternative to conventional free weights or elastic bands. Athletic Trainers prefer it because the color resistance levels are the same as Thera Band Exercise Bands used in physical therapy. It is also used in occupational therapy, orthopedics, pediatrics, sports medicine, home health care, geriatrics, hand therapy, and Chiropractic. The soft cushion handles on these Resistance Tubes are perfect for people who prefer a more cushioned grip. I've only used the bands a few times and have been pleased. The handles are very comfortable to hold.